Let’s hear it for our 1,900th playground! In July, we celebrated our 1,800th playground build. Well, we’ve had a busy few months! Since then, we’ve helped build a hundred more. 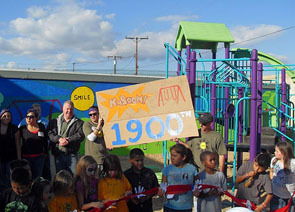 The new playground at Colette’s Children’s Home in Placentia, Calif. marks our 1,900th build. On Saturday, October 30, nearly 300 volunteers gathered to help provide nearly 100 children at this transitional home for at-risk women and children with a safe place to play annually. The Smile Generation, committed to bringing smiles to people’s faces, partnered with KaBOOM! to serve the women and children of Colette’s. Even though rain clouds and grey skies welcomed volunteers, the sun came out to greet them during the opening ceremonies. In addition to moving mulch and mixing concrete, volunteers planted over 50 donated palm trees and painted a large Smile Generation mural. 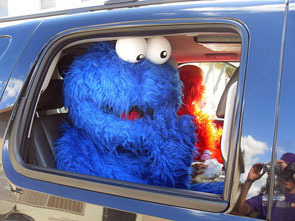 During the day, Elmo, the Cookie Monster, Hello Kitty and Minnie Mouse stopped by to share a dance with the kids. 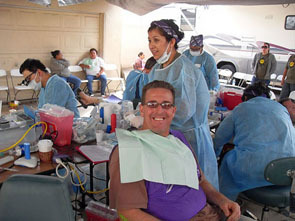 Pacific Dental also hosted a free dental clinic and performed over an estimated $200,000 of free dental work. Congrats to Colette’s on their new playground and special thanks to The Smile Generation for helping to make it possible! 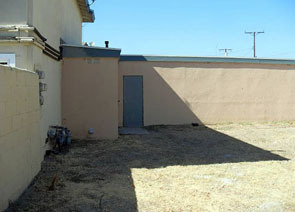 For more photos, visit the build day photo gallery.